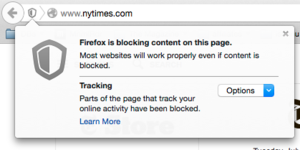 A deep setting in Firefox lets you reduce tracking even further than Do Not Track. It seems to be a dead end, but the path is being well trod. 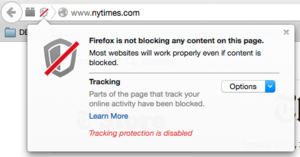 You’d think checking a box labeled Do Not Track would indicate a strong preference for, you know: not being tracked. And yet that is not the case. Those who sell slots to advertisers or gather demographic and other personal data to associate with individuals and improve targeting have a desperate interest in following our every move online. The more closely advertising is targeted to our needs, the more likely we are to not just to pay attention (worth a little), click (worth something), or follow through with buying or signing up (worth a lot). Those who sell advertising slots, and the advertisers who buy them, would prefer to have the best, unmediated access to you. The Do Not Track preference was first envisioned in 2009 as a way for web users to state affirmatively that they didn’t want to be tracked. The idea was that inserting a simple header—a bit of metadata sent from a browser to a server—would be a positive signal. The trick was convincing the browser makers and advertising industries to support it. All the browser makers did, but the industry didn’t. There were issues about whether the setting would be “no choice” along with yes and no, or default to either yes or no. As of now, there’s essentially no mandate or requirement, whether among trade groups or governments, to honor the setting. That’s why Firefox’s Tracking Protection caught my eye. A feature inserted into Firefox, it had the potential to offer a “Hey, Really, Do Not Track” option that would be largely effective. That fact that it’s hidden seems to indicate that it’s already controversial. No worries, though: even if it disappears or you don’t use Firefox, you have alternatives via Ghostery and other tools, as I’ll explain. 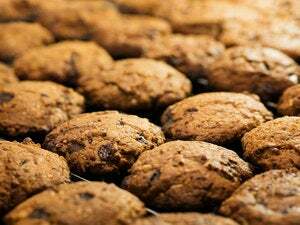 Some networks go beyond using simple browser cookies, which are easy to block or delete, and employ “respawnable” evercookies. These components use various hidey-holes in offline storage and other features in HTML5, Flash, and other systems to cache an ID so that when a cookie is deleted, on the next visit to a site with the network’s scripts in use, the browser cookie is re-created. A different category, supercookies, involve a user’s ISP or cellular provider tagging their sessions uniquely. Even in its best form, there was a dispute in the ad industry over whether Do Not Track meant, “Put a marker that someone shouldn’t be tracked” or “you can track them but you can’t make use of the data in targeting ads to them.” Evercookies and supercookies seem unethical, but may be perfectly legal. All legitimate networks offer some kind of opt-out method, but many work poorly, and you have to opt out often for every browser by network, and sometimes only for a limited period of time. And, as with the Do Not Track quibble, opting out of tracking can mean you’re tracked with a promise to not use identifying information. In the UK, 39 percent have installed ad-blocking software on their PC, mobile, or tablet, whereas in the US this rises to 47 percent. The figures are even higher for 18–24s (56 and 55 percent respectively). I won’t make a moral argument about the necessity of viewing ads when visiting a site that uses them for revenue. The business model of a site isn’t the responsibility of its users, and the number of trackers that users shouldn’t trust is so high that it’s reasonable for people to install ad blockers as a way to get rid of good and bad alike. Likewise, I think it’s absurd to say, “If you won’t load [any or all] ads, you’re stealing.” It’s an extreme position, especially when sites reference 10 or 20 or 30 tracking elements. About half my paychecks as a freelancer come from sites for which advertising is key, and the other half from sites for which subscriptions pay a good part or a large part of the bills. (Ads for subscriptions are ads, too, of course.) The rise of ad blockers will hurt some sites and services, but also lead to development of other kinds of reader revenue, including more paywalls. Some people simply don’t want to see ads, and those who feel that way aren’t valuable lost revenue, because they’re not going to click on things or use calls to action, anyway. But I suspect that many people just don’t want to be tracked all the time and have ads creepily targeted to them. For that group, blocking malicious sites and blocking bad actors—services that aren’t engaged in ethical tracking—would likely be enough. Firefox’s Tracking Protection blocks malicious and unwanted page elements from tracking your session. The paper showed not just the quantity of connections to services identified in this fashion, but also how much faster webpages load without pulling in seemingly unwanted or openly dangerous trackers. The speed is what attracted attention. Tracking Protection can be disabled on a site-by-site basis. In my testing over the last few weeks, Firefox in OS X is definitely zippier, but I’ve also had to disable Tracking Protection for specific sites, especially for use with Facebook logins from other sites. You can use a pop-down menu in the toolbar to disable protection on individual sites. For the most part, most sites work just fine. I like Tracking Protection because of its integration and seemingly light hand in what it does. But Disconnect (which helped provided the blocklist for the feature), Ghostery, and others offer similar or better features. Ghostery, for instance, shows you a count of how many tracking elements on a site when the page loads, and lets you block whichever you like. Ghostery is focused on privacy, not malice. Disconnect has its feet on both pedestals. 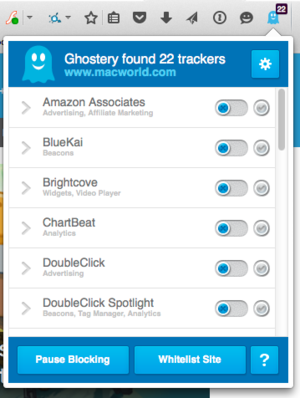 Ghostery reveals the number of different tracking elements on a webpage, and lets you block them. iOS 9 will also support “content-block extensions” for Safari, already available in its OS X incarnation, which can be used for ad blocking. One can imagine Disconnect and others offering these extensions. No matter your feelings about ads, it’s reasonable to be worried about and want to block sites that have no business—literally, it’s none of their business—tracking you, and to be angry at those feeding us malicious software and trying to coax our secrets from us. Some balance would be nice. Without it, readers will continue to take matters in their own hands.